Are you a writer? Enjoy free training from idea to publication. 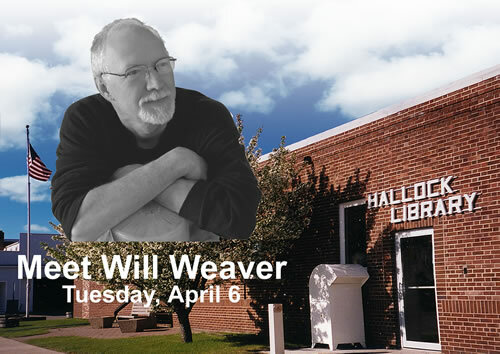 The Expo begins Tuesday, April 6th, with best selling author, William Weaver at the Hallock Public Library. Attend in person, listen online at Blog Talk Radio or dial (646) 727-2510. 7 Minnesota libraries over 7 weeks. Writer's will enjoy free training segments addressing every aspect of writing from idea to publication. There is no need to preregister or to attend at the scheduled time. You may enjoy it live, or download the MP3 afterward. The Expo launches Tuesday, April 6, 2010 at 5 PM CT. Best selling author, William Weaver, will be presenting live at the Hallock Public Library in Hallock, Minnesota or you may listen online at http://www.BlogTalkRadio.com/MarniesFriends, or by phone at (646) 727-2510. At 7PM CT, Weaver will present on the topic, "What's Your Story?". We all have life experiences that are significant and valuable. Enjoy an evening of strategizing about how to capture and express our stories. According to the New York Times, "Will Weaver views America's heartland with a candid but charitable eye...."
Weaver has published ten award-winning books of fiction for adults and young adults, most recently Barns of Minnesota and the novel Saturday Night Dirt. Several of his stories have been produced for radio and film. He lives and writes in Bemidji, Minnesota. Patrons who live in Northern Minnesota are encouraged to carpool to meet Will Weaver. Carpool locations include the Greenbush Public Library, Red Lake Falls Public Library, Roseau Public Library, Thief River Falls Public Library, Warren Public Library and Warroad Public Library. Departure times and details are available at http://www.Facebook.com/NWRLib under "Notes". This project was funded in part or in whole with money from the vote of the people of Minnesota on 11/4/08 which dedicated funding to preserve Minnesota's arts and cultural heritage. Sponsored by the NW Regional Library. http://www.NWRLib.org. Produced by Marnie Swedberg, http://www.Marnie.com. The Northwest Regional Library consists of seven libraries in seven rural northern Minnesota communities including Greenbush, Hallock, Red Lake Falls, Roseau, Thief River Falls, Warren and Warroad.